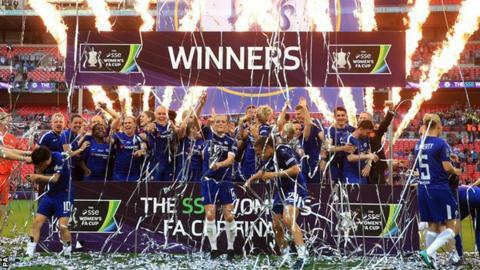 The BBC will show both Women's FA Cup semi-finals live, with holders Chelsea travelling to Super League leaders Manchester City and Reading hosting West Ham United. The games will be played on Sunday, 14 April, with the final - broadcast live on BBC One - to be held at Wembley on Saturday, 4 May (17:30 BST). Reading v West Ham (12:30 BST) will be live on BBC Red Button and iPlayer. Manchester City's game against Chelsea (15:30 BST) will be live on BBC Two. Chelsea's game against City is a repeat of last season's semi-final, which the Blues won before going on to beat Arsenal in the final. Nick Cushing's Manchester City are on course for a treble after winning the League Cup in February, and are six points ahead of third-placed Chelsea in the WSL table. The pair have never met in the FA Cup final, but the meeting will be their seventh in domestic semi-finals since 2014. Manchester United, Aston Villa and Durham - the only non-WSL sides in the quarter finals - were all knocked out on Sunday.